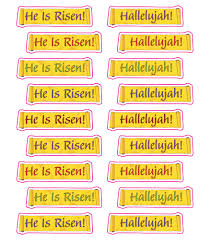 Motto: 9 stickers: He is Risen! 9 stickers: Hallelujah! Scrolls with printing in assorted colours. Sticker size: 4.5 x 1.3cm. Carson Dellosa stickers can be purchased in a pack or as single sheets. Each sheet of stickers is 122 x 146mm.